Time at the painting table was limited this weekend, and to be honest, the sheer heat (and a broken AC!) here in California didn't lend itself to getting much done. That said, I did sit down and decide to get something done while I waited for Game of Thrones, so this was the result . . . I have no idea whether he'll actually be useful in the recently released MKIII rules for Warmachine and Hordes, but he was a relatively cheap impulse buy when I was grabbing my monthly stash of comics from our local hobby store. Blocking out the color scheme. 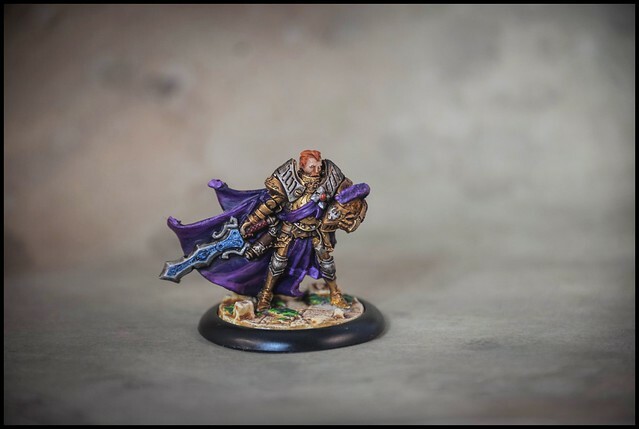 My Cygnar use one of two purple schemes. I do the officers and Warcasters with this deep, darker, royal purple. No base crafting this weekend, just went to the bits drawer and one of the bases from Micro Art Studios that I had picked up in their Kickstarter last year. For some reason I have always liked painting flowing cloaks and capes, and I'm happy with th results again here. Overall I'm happy with the final result. Now I guess I should see if there is an actual army list that is a useful part of!